Becky Carroll from Customers Rock! has launched Customers Rock! Radio. 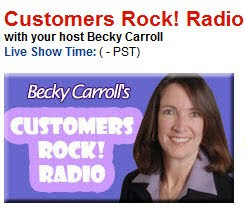 It's a weekly hour-long radio program focused on growing customer relationships and creating WOW customer experiences - something that Becky is passionate about and celebrates on her blog. Becky invited me to take part in her Customers Rock! 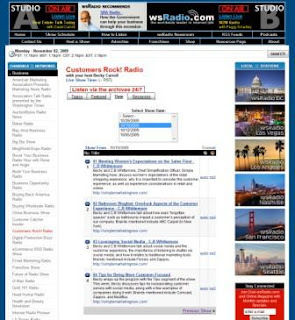 Radio program on Monday, October 19th, 2009 to discuss marketing to women, the customer experience, the retail experience and the 4th annual Bathroom Blogfest. We had a blast. Becky and C.B Whittemore, Chief Simplifer, Simple Marketing Now, discuss women's expectations of the retail shopping experience, why it is important to consider the customer experience, as well as experience considerations in retail and online. Becky and C.B Whittemore talk about how even “forgotten spaces” such as bathrooms impact a customer’s perception of our company. Brands mentioned include ABC Carpet (in New York). Becky and C.B Whittemore talk about social media and the customer experience, the importance of listening to chatter via social media, and how it relates to traditional marketing tools. Brands mentioned include Fiskars and Zappos. Becky wraps up the program with the Tips segment of the show. This week, Becky discusses tips for incorporating customer service with social media, along with a few examples of companies doing it well. Brands mentioned include Comcast, Zappos, and BestBuy. Becky has also invited Jeanne Bliss, Esteban Kolsky, and Michael Brito onto Customers Rock! Radio. By the way, Becky Carroll participated in my Bridging New & Old social media series, sharing valuable insights. Thank you, Becky, for a lively Customers Rock! conversation and for including me in your program! 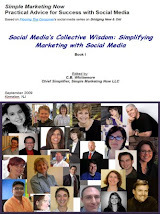 How Do I Start With Social Media? What Questions Do You Ask About Customers?